In 2004, Ian graduated as a podiatrist from the Queensland University of Technology in Brisbane and began his podiatry career at a well-established sports podiatry practice in Brisbane’s inner city suburbs of Fortitude Valley and New Farm. 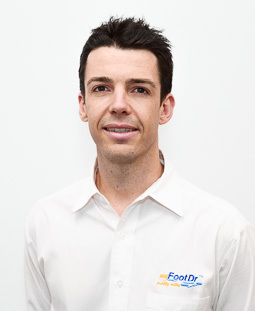 Ian began working with my FootDr podiatry centres in December 2005 and managed the Fortitude Valley podiatry centre from 2006 until 2015. From the latter half of 2015, Ian relocated to my FootDr’s head office in Camp Hill. The group’s Centre of Excellence also contains the Australian Foot & Ankle Institute (AFAI). As well as being one of Australia’s largest podiatry clinics, this modern, purpose built centre boasts onsite footwear retail outlet, medical specialists, massage therapy, a pedorthic facility, and an orthotic and prosthetic (O&P) fabrication lab. At this clinic Ian is able to work across the full scope of podiatry practice and manage complex cases with a skilled multidisciplinary team. Ian is very proficient in all areas of podiatry and enjoys a varied case load of podiatry services. His special interest subspecialties include podopaediatrics, sports podiatry, orthotic and prosthetic manufacture, pedorthics, verruca and nail surgery, as well as diabetic foot assessments. Ian is a sought after provider of medico legal reports and has experience in cases of workplace injury compensation. Another exciting area for Ian has been Occupational Podiatry, and he has worked hard to build relationships with a number of local and national companies. Ian has extensive first-hand experience in preventative treatment programs for large workplaces including Brisbane City Council and Queensland Rail. Ian is one of Australia’s most experienced providers of PinPointe FootLaser, which is a cutting edge modality used to treat fungal nail infections. Ian has played an active role in training many of the providers of this device nationwide. As one of the practice’s most experienced podiatrists, Ian acts as a mentor to many of the staff at the Camp Hill facility. Ian was also elected as a senior member to the organisation’s Clinical Governance Committee which steers training/development and innovation across the entire group. After 14 years practicing podiatry in Brisbane, Ian has developed a strong patient following, as well as a vast network of like-minded health professionals. Ian works closely with GPs, sports physicians, physiotherapists, chiropractors, massage therapists and more both in his local area and across Brisbane more broadly. Ian holds a number of professional memberships including The Australian Podiatry Association (QLD), and Sports Podiatry Queensland. He also enjoys contributing to the ongoing education of the profession, by mentoring final year podiatry, pedorthics and podiatry assistants from a number of universities and other tertiary education institutions both locally and interstate.